Every week, we see Twin Cam models that have already, well exceeded, 50k miles. Depending on how a bike has been maintained, 40k to 60k miles are milestones for larger maintenance procedures and repairs to be considered. 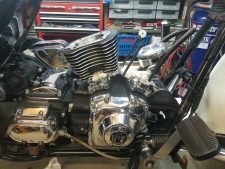 One of the most common overhauls is a top end rebuild. 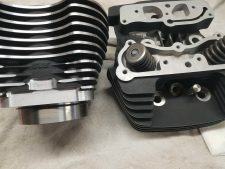 Freshening up the top end of your Twin Cam can be as straightforward as boring & honing cylinders, installing +.010″ oversize rings, a valve job, and all gaskets from the base gaskets and up. 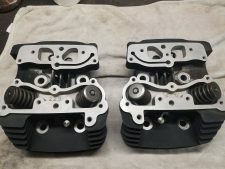 However, many riders, at this time, will opt to put together a performance package to achieve more torque and horsepower. 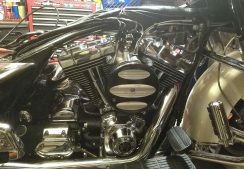 Recently, In The Shop, we had one of our regular customers drop off his 2001 Road King. He has been maintaining and upgrading this Road King every year since purchasing it approximately ten years ago. This year our focus was to address the stock 88 Twin Cam motor. The customer does not tend to pound on his Road King. 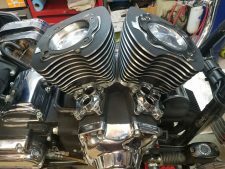 His main objective for the rebuild was to put together a motor that would help him keep up with the larger motors that some of his buddies have in their newer HDs. 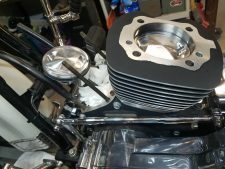 The package we put together was built around the S&S Cycle 100 cubic inch, Sidewinder, big bore kit. The kit from S&S is beautiful. It comes complete with pistons, rings, wrist pins & clips, cylinder dowels, all necessary gaskets & o-rings. 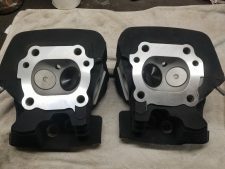 The heads were given to our local, go to, machinist to be ported and drilled for compression releases. See the photos. Really impressive work. We installed S&S 510 cams with an S&S hydraulic upgrade kit. Also, S&S tappets and S&S Quickie adjustable pushrods. The bike already had a Power Commander V and a Barnett Scorpion clutch assembly. The Magnetti Morelli injection system on this 2001 still operates surprisingly well. However, the plan for next winter may be to convert this Road King over to a carburated fuel system. OR, chain drive. 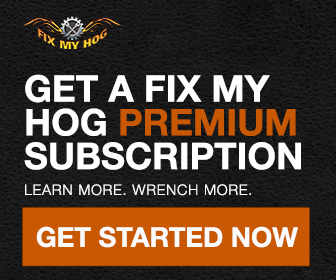 If he starts laying belts on the ground with this additional torque!